Think kale recipes are boring? Think again! Here are 7 delicious ways to work this “superfood” into your diet. Even as the weather starts to get cooler, kale is one mainstay green that you can count on all fall, winter, and spring as a source of iron, calcium, potassium, and antioxidants. Hearty kale also contains a significant amount of vitamins A, C, and E.
As if that’s not enough to convince you to incorporate this leafy green into your diet, it’s versatile too. Not just for salads, kale can be used to make side dishes, casseroles, fried rice, and nutritiously power-packed green smoothies. 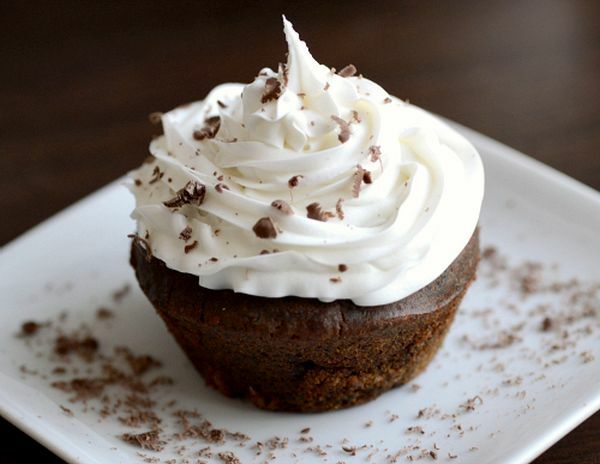 You can even sneak kale into chocolate cupcakes! There’s no meal as hearty as meat and potatoes, and this recipe gives the classic combo a nutritious overhaul. A baked sweet potato is topped with succulent chicken seasoned with paprika, chipotle, and cinnamon. Toasted pepitas add crunch as a garnish, and creamy feta ties it all together. 1. Preheat the gill to medium-high heat. Coat the chicken breasts liberally with avocado oil. Then season them with paprika, chipotle, cinnamon, garlic salt, and pepper. Allow to sit for 10–15 minutes. 2. Grill for 5–10 minutes per side (depending on size), or until grill marks show. Set aside to rest, allowing the meat to come to room temperature. Once cooled, shred the chicken using two forks. 3. Add the chopped kale and bell pepper to a large bowl, and mix in olive oil, lemon juice, sea salt, and pepper. Massage lightly with your fingers to soften kale. Add the shredded chicken and feta, and toss well. 4. To assemble, slice the sweet potatoes open lengthwise, and lightly mash the inside. 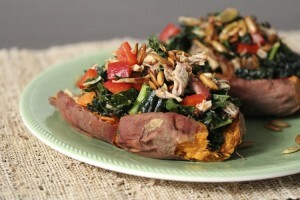 Scoop large spoonfuls of the chicken-kale mixture into the middle of each sweet potato. Sprinkle with toasted pepitas for a garnish. Serve warm or at room temp. Next time you’re planning to cook your favorite Chinese dish, whether it’s orange chicken or Char Sui pork, try it with this nutrient-infused version of fried rice. 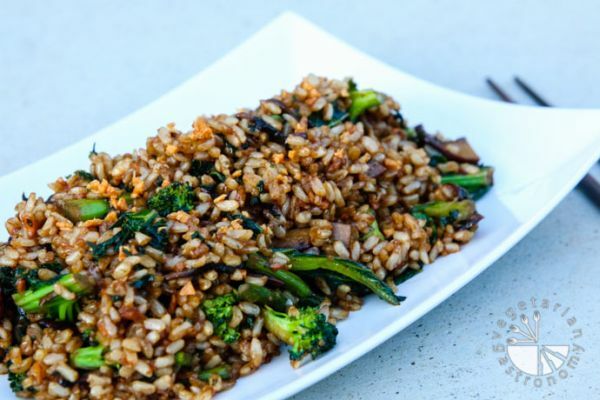 Along with the star superfood kale, there’s mushrooms, broccoli, bok choy, and asparagus. Add a little garlic, soy sauce, and sriracha to compete the well-loved flavor profile. 1. Set aside 2 tsp. of garlic. In a small bowl, toss the remaining amount of garlic with a pinch of salt. Heat vegetable oil in a small saucepan over medium-low heat. Slowly fry the garlic-salt mixture until slightly browned and crispy. The garlic should maintain a gentle bubble while cooking; if not, reduce the heat. Once the garlic is golden brown, transfer fried garlic to a paper-lined plate to cool. Drain and reserve the garlic oil. 2. Add 1 Tbsp. of garlic oil to a large wok or non-stick pan, and place over medium-high heat. Add the asparagus, mushrooms, and broccoli. Toss to combine, season with salt, and stir-fry until the vegetables begin to get tender. A few minutes before the end, add baby bok choy and kale. Stir fry for 2–3 minutes, until the water released from the mushrooms has evaporated. Transfer to a bowl, and set aside. 3. In the same wok or pan, heat another 1 1/2 Tbsp. of reserved garlic oil. Add the 2 tsp. minced garlic (previously set aside), and cook until fragrant, about one minute. 4. Add the cooked rice into the garlic oil, breaking up any rice clumps. Feel free to add extra oil if necessary to prevent sticking. 5. Add all the stir-fried vegetables, and toss with the rice. Stir in the soy sauces, sugar, chili sauce, and a few drops of sriracha. 6. Turn off the heat, sprinkle the fried garlic over the top, and toss once more. Serve hot. This side dish is easy to make and will match any main protein: chicken breast, roast turkey, sirloin steak, or seafood. Or if you need a healthy snack for the whole family, or something more substantial than a smoothie to refuel your body after a workout, simply whip this up in 10 minutes or less. 1. Prepare the sauce in a small bowl, mixing together the yogurt, honey, lemon juice, and sumac. Set aside. 2. Heat a large frying pan or wok, and add the kale and oil. Add 1/2 cup water, and toss. Cover to cook for 2–3 minutes. Add the remaining water, and cook until the liquid has evaporated. 3. Clear a space in the center of the pan, and add the butter and garlic. Sauté for one minute, and then stir it into the cooked kale. 4. Squeeze lemon juice over the top, and season to taste with salt and pepper. 5. 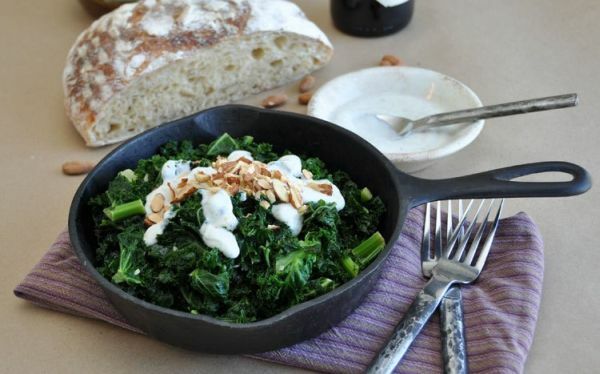 Transfer the kale to a serving dish, and drizzle the yogurt over top. Sprinkle with sliced almonds to finish. Green smoothies have been popular for a while now, but it takes more than sticking kale in a blender to make a good one. This recipe, aka the Tastes-Like-Ice-Cream Kale Shake, is sweetened with chopped pitted dates and bananas. To increase the milkshake facto, there’s also a handful of cashews and a splash of vanilla extract. 1. Add all ingredients to a blender, starting with the ice and water. 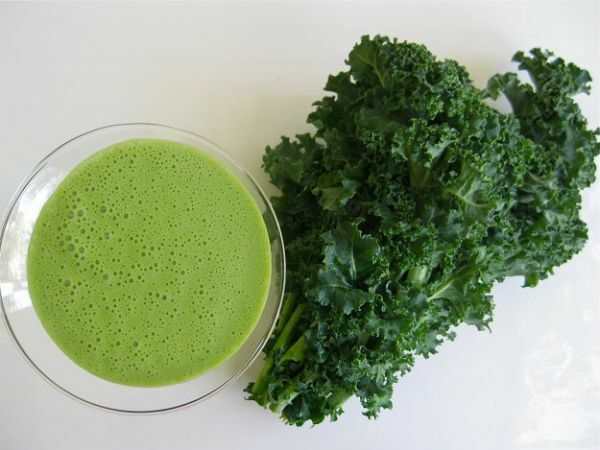 If using a single-serving blender, put the kale first into the bottom of the cup. 2. Blend until smooth, and enjoy! If you want a way to hide kale in a family-friendly recipe, look no further. 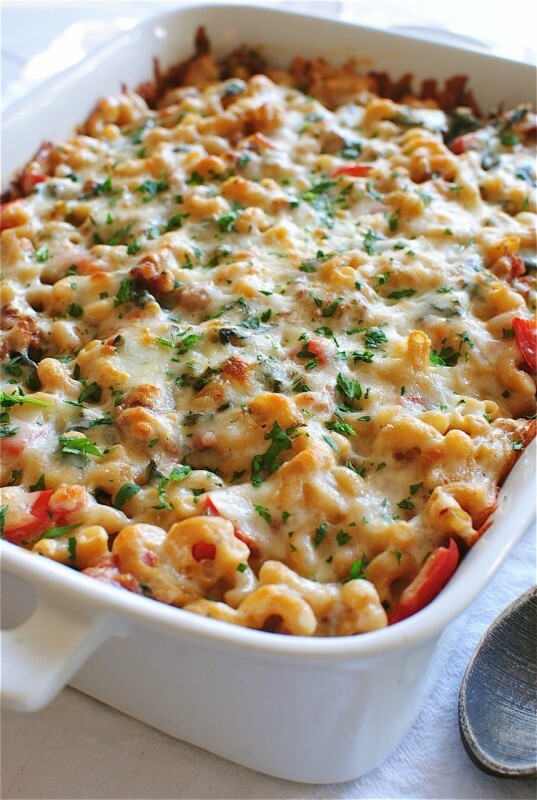 This cheesy, melty casserole doesn’t stray far from the traditional, with mozzarella, sausage, elbow noodles, and even butter for a flavor all ages will love. But it also incorporates kale for its numerous health benefits, including iron, vitamin K, antioxidants, omega-3 fatty acids, calcium, fiber, and detoxifying sulfur. 1. Preheat the oven to 350°F. Bring a large pot of salted water to a boil. 2. Heat a large skillet over medium-high. Add the sausage in torn chunks, and cook until brown all over. In the meantime, add pasta to cook until right under al dente, about 5 minutes. 3. To the pan with sausage, add the red bell pepper and kale, sautéing for another 3 minutes, until the kale wilts. Season with a tiny pinch of salt. Add cooked pasta, and toss to combine. Remove from heat, and set aside. 4. In a small saucepan, melt the butter. Add the flour, and whisk for a couple minutes. Then add the milk, and whisk until creamy, 5–8 minutes. Transfer the cream sauce to a food processor, and add the chipotle peppers with adobo sauce. Pulse to combine. Taste, and add another pepper and a pinch of salt, if desired. 5. Add the cream sauce to the pasta-sausage mixture. Toss until evenly combined. Transfer to a rectangular baking dish, and sprinkle shredded mozzarella over the top. Bake uncovered for 30 minutes, until the cheese is golden brown and bubbly. Think it’ll take a lot of effort to transform kale into something you’ll find appetizing? Well this recipe couldn’t be any easier or quicker, and it makes this leafy green extra crispy and savory. And as we all know, anything is more delicious when it’s fried! 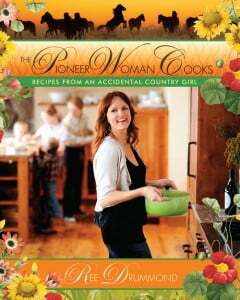 For more recipes by Ree Drummond, pick up The Pioneer Woman Cooks: Recipes from an Accidental Country Girl. 1. Thoroughly rinse the kale in cold water, soaking if necessary to remove grit. Tear the kale into chunks. 2. Heat the olive oil in a large skillet over medium-high heat. Add the garlic, and quickly stir it around to avoid burning. 3. Throw in the kale, and use tongs to move it around the skillet. Sprinkle in salt and pepper, and continue cooking until slightly wilted but still crisp, about 1–2 minutes. 4. 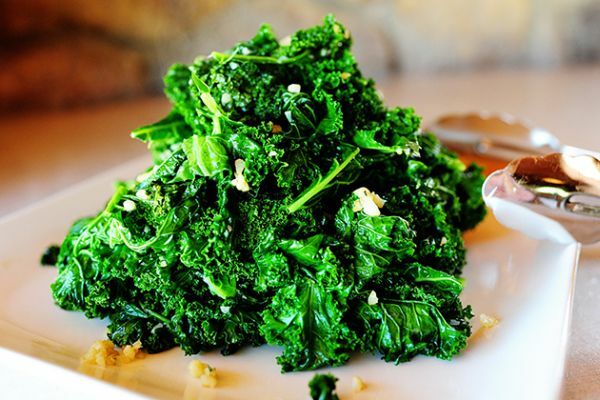 Remove the kale to a plate, and squeeze lemon juice over the top. Serve immediately. As promised, you really can make cake with kale. These cupcakes don’t stray too far from the ordinary with a base of flour, milk, brown sugar, and honey, but they have added nutrition with beets, kale, and applesauce. The picture of the perfect healthy dessert is completed with cream cheese frosting, which adds minimal fat and sugar for a frosting without lacking any of the expected flavor. 1. Preheat the oven to 375°F. Place the beets in a baking dish, and roast for an hour, or until you can easily pierce the vegetables with a knife or fork. 2. Reduce heat to 350°F for the cupcakes. Line 2 standard muffin tins for 16 cupcakes, or grease well with butter or coconut oil. 3. Once the beets have slightly cooled, peel the skins off. Cut into chunks, and place in a blender or food processor. Add water and kale, and blend until fully pureed. Set aside. 4. In a large mixing bowl, beat the applesauce, sugar, and honey together. Add eggs and vanilla, and mix well. Add the beet-kale puree, and stir with a wooden spoon to combine. 5. In a smaller mixing bowl, whisk the flour, cocoa powder, baking soda, baking powder, and salt. Add 1/2 the dry mixture to the wet ingredients, and stir to mix. Add 1 cup of milk, and mix. Add 1/4 more of the dry mixture, and stir. Add remaining milk, mixing to combine, and then incorporate the last of the dry. Be careful not to overmix. 6. Fill the muffin tins about 2/3 of the way full with batter. Bake for 18 minutes, or until a toothpick inserted in the center comes out clean of batter. Let cool completely. 7. To make the cream cheese frosting, beat together the Neufchatel, butter, and powdered sugar. Transfer to a pastry bag or zippered plastic bag, and snip off the end. Use to decorate the cupcakes, once they’ve had a chance to fully cool. What did you think of these healthy kale recipes? Have anything else to share? Let me know in the comments below!